5 suites - including the Master Suite located on Level 11, this suite provides the hotel's premier accommodation. Comprising a large bedroom equipped with a king size bed and oversize en-suite, separate dressing area, guest powder room and combined lounge/dining area furnished with a dining area setting for six, the suite inter-connects with a further twin bedroom if required. Photo copyright Vibe Savoy Hotel Melbourne. 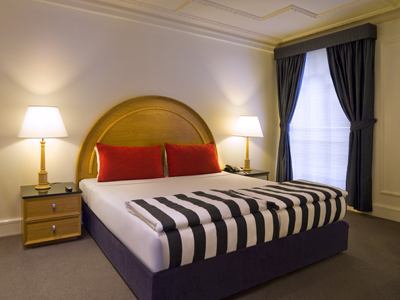 You will love the convenience of staying in the very heart of all the action in the Melbourne city centre. Blending the zest of the Vibe Hotel brand with the beautiful façade of a heritage building, Vibe Savoy Hotel Melbourne is located only a couple of blocks from the hub of Melbourne's Collins Street. The exciting Melbourne CBD is made up of precincts – distinct enclaves, each with their own flavour and charm. Vibe Savoy Hotel Melbourne is the perfect Melbourne hotel to base yourself; you are ideally located to take advantage of the Melbourne's tram and rail network as well as easy access to the Etihad Stadium and exciting Southbank precinct as well as the Melbourne Convention & Exhibition Centre.